Few in the crowd of several hundred people watching the end of the NYRA Jockeys vs. Philadelphia Orchestra softball game Monday evening noticed the shiny black Mercedes Benz S-Class sedan roll up to the Saratoga East Side Rec Center stadium and park within feet of the backstop. The score was tied 11-11 after seven innings of regulation play, and had been since the fifth. It was an ideal starry night. The mosquitoes were buzzing and the game’s MVP Channing Hill was being intentionally walked to load the bases with two outs in the first frame of extra inning play. The Jockeys won 12-11 in the ninth. Marylou Whitney and John Hendrickson emerged from that Mercedes. The Saratoga socialite wore a white gauze blouse, her hair was pulled back and her face – that beautiful face with its perfect complexion – smiled a smile that was gracious and genuine. “Here’s a diamond, and there’s a bigger diamond,” joked Hendrickson, bending gently with his hand gesturing first at Marylou’s throat where a strand of DeBeers’ best was displayed and then to her ring finger where a rock the size of home plate rested before pointing to the ball field. Whitney and Hendrickson are in full command of Saratoga’s social agenda. They attended the ball game to lend a show of support for the Permanently Disabled Jockeys Fund, an organization for which funds were being generated. Whitney is the Honorary Chair of the Saratoga Performing Arts Center, too, where the Philadelphia Orchestra is in summer residence for one more fortnight. After the game, the orchestra’s team members dutifully (and sincerely) formed a line to thank Whitney and Hendrickson for coming. Admiration for Whitney’s and Hendrickson’s generosity will rain in the next several days. Tonight they will serve as the Honorary Chairpersons for the Saratoga Hospital’s 29th annual benefit and auction. On Saturday, following the gr. 1 Whitney Handicap at the racecourse, they will honor Ann-Margaret with a Lifetime Achievement Award at the Silver Anniversary Gala of the National Museum of Dance and Hall of Fame, an institution that Whitney founded. In addition, the Fasig-Tipton Company has reserved two front row seats for them at the Yearling Sales on Monday and Tuesday. Speaking of Fasig-Tipton, the Kentucky-based, Dubai-owned sales agency seems to have made out well on its most recent investments in Saratoga. With its troubles behind and its war with the State cooled for awhile, NYRA is enjoying a reputational rebirth. The calm has helped the current race meet to get off to a positive start, with attendance up slightly and handle considerably. Should the good weather hold steady, this weekend’s Fasig-Tipton Festival of Racing should be noteworthy. Today, Saratoga Racecourse celebrates Mid-Summer St. Patrick’s Day. Appropriately, the $75,000 John Morrissey Stakes for NY-Breds headlines the card. In the meantime, fingers are crossed that rocker Tommy Love will front Blue Hand Luke at Siro’s tonight. If Love doesn’t, head to SPAC to see cellist Yo-Yo Ma. 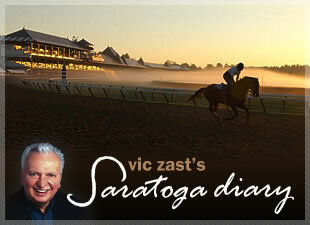 Vic Zast is the author of “The History and Art of 25 Travers.” He’s attended the races at Saratoga for 48 straight seasons.